Not going to lie, today's "theme" boggled my brain. I had no idea what I was going to do for my project until I heard "twinkle twinkle little star..." on a TV commercial. Then it hit me! I love it when inspiration comes from every day things. So, here is my bedtime themed project! Hope you enjoy. The light blue card stock base is 4 3/4 by 5 3/4. I rounded the edges with a corner punch. 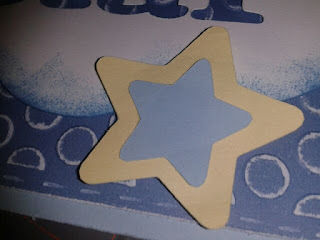 The first layer is from Spring Holiday Cards, and it is the Background 4 cut. It is cut at 4.319. 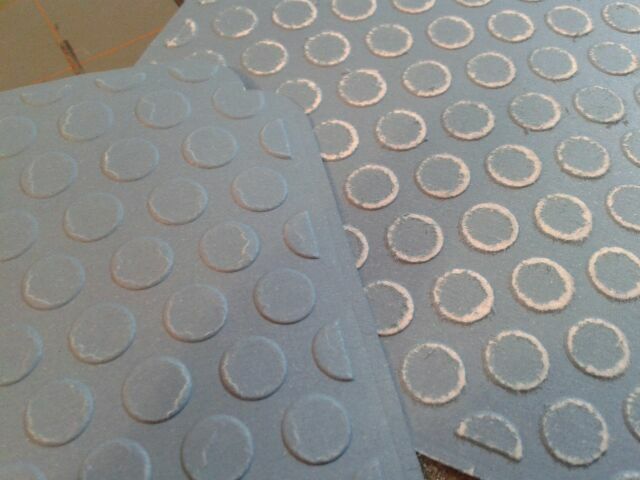 I ran it through the Cuttlebug using the Seeing Spots embossing folder, and then lightly sanded it to make the dots "pop." the card stock I used has a white core, which really helps. If your card stock doesn't have a white core, the sanding won't be that noticeable. I cut the cloud shapes using Home Accents. The cut has the word "dream" on it, which I didn't want, so I hid it using Cricut Craft Room. They're cut at 3.181. 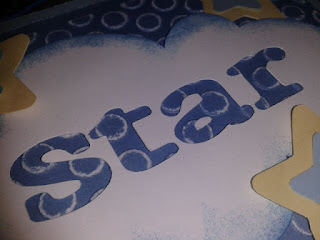 The words "star" and "little" are welded to the clouds using CCR. The font is from Plantin Schoolbook, and it's cut at approx. .792. "Twinkle twinkle" is from the nursery rhyme cut on the Word Collage cartridge. I used CCR to hide all the other words on the cut, and placed the words I wanted on the cloud so they would be welded together. 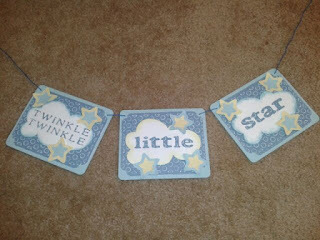 The stars I got from Chore Chart Lite, and I cut them in two different sizes - 1, and 1.625. I tied all the banner pieces together using blue embroidery thread, but you could use just about anything to tie them together. I really love the way this project turned out. Goes to show, inspiration literally IS everywhere. Hope you enjoyed today's project, and make sure you stop by MCCR to see what my Design Team Sisters created for you today as well! This is just such a sweet banner and love how you told the story of the inspiration! We find it all around us! Very cute project! See now, it was meant to be for you to hear that song. Your banner is adorable. 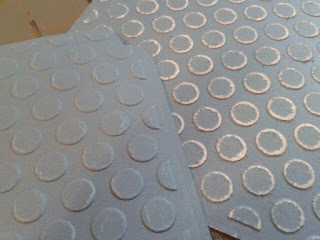 Great embossing and sanding effect. I love ur banner. It's very sweet! Great JOb! I soooo Love this project. Going to be scrapjaking it for the new nephew that's on the way. Great job. Sooo super cute, Melissa! 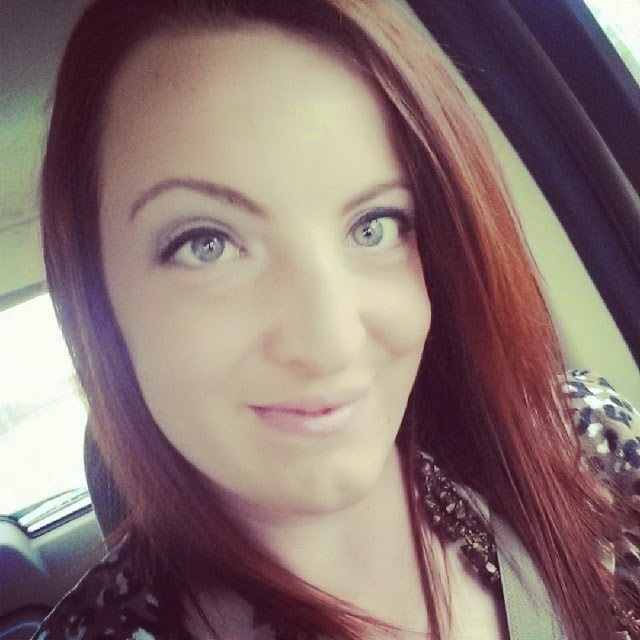 Totally love your banner! love this banner.. its adorable! the colors and the embossing are great tfs! Oh my the banner is adorable!!! Love the details you added to the backgrounds. Great Job! I love banners and your's turned out great.. Love the colors, plus the embossing (I need to do that more)and the small details really brings it all together so sweetly.. Your banner turned out adorable! I could totally see that in a baby's room on the wall or over a changing table. TFS. Your project is wondeful.